Package: 2 pieces glass planter and plastic hooks. Size: widest length is 4 1/2", height is 6", 3 1/8" in deep, the opening diameter: 2". These wall hanging glass planter can be hung from a hook or cord whether it is from the wall, or outside on your patio. Great to show your lovely plant such as air plant, succulent, hydroponic or other small plant. Good choice for you to put some white rocks, pebbles, acrylic, and other decorative items that make your plant more beautiful and more shine. Great gifts for your family or friends that add natural and gardening to any home space. These wall hanging planter are ideal for your cute small plant like air plant, succulent or hydroponic. As a perfect decoration pieces for home, garden, wedding or holidays. Package included: 2 pieces glass flower pot and plastic hooks. Material: High boron silicon heat resistant glass. No plant and props included in this item! Easy hanging: the small hole in the back allows you to attach this glass vase to any wall using appropriate mounting hardware. 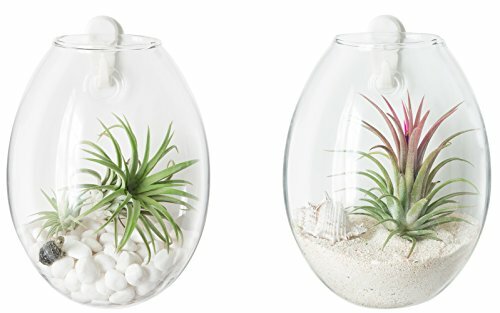 Features a bubble shape made out of clear, sturdy glass with a round hole at the very top that allows you to add plants, white rocks, pebbles, acrylic, and other decorative items with ease. Size: widest length is 4 1/2", height is 6", 3 1/8" in deep, the opening diameter: 2". Mkono is a registered trademark and our product is professional manufacturing and sole selling.